When you add a user account to LibCRM, you can assign it one of two permission levels: admin or regular. Below is a summary of permissions for each level of user account. To add and manage user accounts, go to Admin > Manage Accounts. Under the Accounts tab, click on the New Account button. Enter the User's Email address and click the Search button. If the email address is already associated with a LibApps user account, then that account will be used. Otherwise, a new LibApps account will be created for that user. Configure the user's account as needed. If this is an existing LibApps account, you cannot edit their name in LibCRM -- only their account level. Their name can only be customized via their LibApps user account settings. If this is a new LibApps account, enter the user's first name & last name, then select their account level. The user will receive a welcome email with information about signing into your LibCRM system. If this is a new LibApps user account, they will receive another email with information about setting their account password. 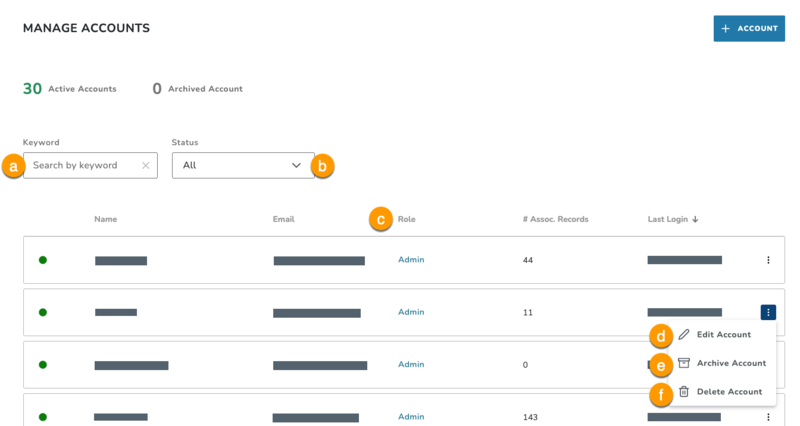 To more easily locate an account, use the Search FIlter field above the accounts list. If there are multiple pages of users in the list, use the page navigation options to adjust the number of records per page, and move between pages. Click on any column heading to sort by that column in ascending order. Click it again to switch to descending order. To edit a user account's permissions, click on its mode_edit icon in the Actions column. Note: you cannot edit a user's email address or name in LibCRM. This can only be done in the user's LibApps account settings. To delete a user account's permissions, click on its delete_forever icon in the Actions column.